Click Here To See Conan #3 Comic Book! 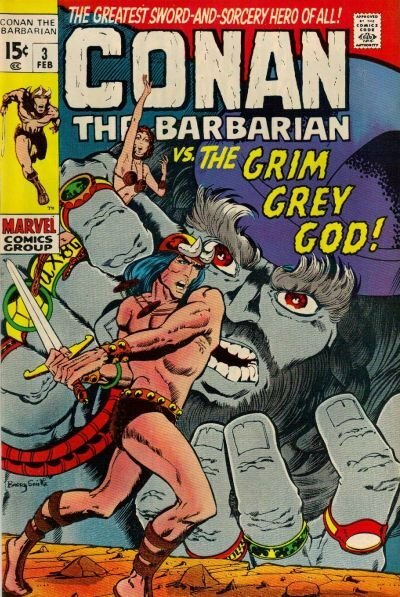 Roy Thomas and Barry Windsor-Smith's Conan the Barbarian was a real game-changer for American comic books. Suddenly, super heroes in spandex weren't the only game in town for serious lovers of the medium, and sales for this title took off like a rocket headed for the stratosphere. Barry Smith's art was often detail-filled, and possessed a lot of power. This page from "The Twilight of the Grim Grey God," chronicles a fierce barbarian battle, as the gray god Borri looks on. The art is in ink over graphite with Zipatone shading film on Bristol board; the first three panels have been cut and placed perfectly with exacto knife with other panels, where Smith drew the remaining panels. The art looks great, and is Signed in the fourth panel by Barry Smith. BRONZE AGE Early BWS Conan pages are getting increasingly hard to find, so don't miss out on a great opportunity here to own a nice Bronze Age 1970 BWS Conan page! ALL art on our website (including this one) are able to be purchased with VERY fair time payments, and trades are always considered towards "ANY" art on our website! Just send us an email to mikeburkey@aol.com and we can try to work something out.